The demonstrations do not stop after Mubarak's speech and the declaration of the Supreme Council of the army. The international community is guided only by their own interests, but does not understand the needs of the Egyptian people. Should be supporting the youth of Tahrir Square. The transition in Egypt is a symbol that can change the Arab world and the planet. Cairo (AsiaNews) - Tahrir Square is not only about social demands (wages, jobs, bread, etc. ..), but implementing change in Islam. Young people reject both the military dictatorship and the Islamic republic, they want a modern state that guarantees full citizenship to all, Christians or Muslims. Proof of this is that since 25 January, when the demonstrations began, police have removed security details from Christian churches and there have been no attacks. This is why, what is happening these days in Cairo has the power to change the Arab world and the entire planet. Here we publish the considerations of an illustrious figure from the Egyptian Christian world, who wanted to share them with AsiaNews readers. The name used is a pseudonym. Still today, Tahrir Square is overflowing with hundreds of thousands of young and old, men and women, disappointed and unhappy about Mubarak's speech yesterday. Last night, the Rais, in a televised address categorically ruled out his abandonment of power, which the crowds continue to demand. Mubarak has only promised to cede some powers to his deputy Omar Suleiman, but insists on remaining in power until presidential elections next September. Today, while the number of demonstrators increase in the beautiful capital and other cities of Egypt, the Supreme Council of the army says it will remove the state of emergency "as soon as the current situation ends". 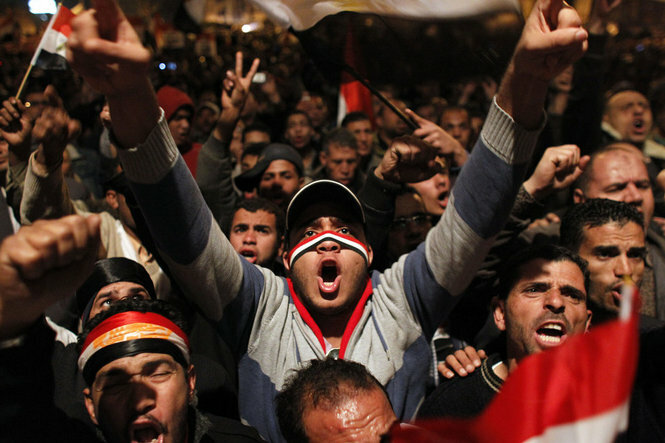 Some believe that there has been a split between Mubarak and the army and that the soldiers will eventually throw their support fully behind the population. The full picture of behind the scenes manoeuvres is still unclear: it is like being in fog. But one thing is certain: the young continue to demonstrate, demanding more and more. It is important to maintain pressure on the power and never allow it time to gather, contented with generic statements and vague promises. These young people will not stop making their demands and the protests will continue. They have been so badly deceived and treated by the regime that they will not leave the square. If they stop, society will once again fall into the hands of the dictatorship. From this point of view it is interesting to hear the words of one of the most famous activists (see: http://www.youtube.com/watch?v=vL8Vi6CaCCM ). The hope is that it does not slide into violence. It seems to me that so far that the young people and the army have a kind of “gentlemen's agreement” not to resort to violence. The criminals used violence, not the young people. It has made a lasting impression on the international community. Rumours abound that an American aircraft carrier has arrived in the Persian Gulf and another in the eastern Mediterranean, perhaps to ensure traffic in Suez, Israel has urged Egypt to achieve a “peaceful transition”, that Iran has expressed its hope Egypt will become an Islamic Republic along its own lines….. Faced with these popular riots, everyone is looking after their own interests. None of these foreign powers is paying the slightest attention to the best interests of the Egyptian people. All are driven by realpolitik and by their own affairs. In the short term this bears fruit, but in the long term it only brings defeat. The U.S., for example, have always supported Islamic fundamentalists (Saudi Arabia, Taliban, etc ...). In this way they have secured oil profits. But the spread of Islamic fundamentalism in the world has put all western civilization at risk. The most serious is that the more the fundamentalists raise their voices, the more the moderates are silent. We risk throwing away world culture and civilization as a result of a violent and fanatical group, which silences and intimidates the moderates in the West, who are only concerned with uttering politically correct phrases, so as not to appear too anti-Muslim, or Islamophobic. The majority of states in the West falls into this trap. The left-wing governments have done nothing but welcome, dialogue, and in the name of humanity, of tolerance, drained the coffers of social security. We are now facing a social failure and a failure of civilization. The left-wing governments were corrupt. For their part, the right-wing governments also played the game: they took power by giving a harsher response, opposing the Islamic world, without dialogue. What is happening these days in Egypt, is an important step for the Arab world and the rest of the world. It is now clear to everyone that what we are experiencing is not simply a domestic problem but an issue that embraces the entire world. What happens here goes far beyond national boundaries. Young people are not only demanding more social security, but Islam is going through a change. The young people demand a clear distinction between religion and politics. They reject both the military dictatorship and the Iranian style Islamic revolution. They want a system of government based on civil society. They want freedom, a modern state of rule. If Egypt does this, the entire Arab world will follow, because it is the leading country of the Arab-Muslim world. But if this happens in the Arab world, the world will follow. Egypt is a symbol. Although the majority of young Muslims who are in Tahrir square, they reject an Islamic state, modelled on the Muslim Brotherhood. These are increasingly marginalized and have much less weight and influence than most think. Mubarak gave them immense power. But the reason is now clear: raising the spectre of Islamic fundamentalism in front of the United States, he received large economic concessions. Exaggerating the danger of the Muslim Brotherhood against Israel, was a easy game to ensnare the United States, hinting that without him there would have been war, violence, the Islamic state. It is worth noting a fact: after January 25, police stopped the security checks and surveillance in front of churches. It was feared that there would be attacks and destruction - as was the case on December 31 at the Church of Alexandria - and yet nothing happened. So much so that some suspect that the bombing of Alexandria was caused by sources close to the Egyptian Ministry of the Interior. I want to make an appeal to you Westerners: give your moral support to the young Egyptians, put pressure on your governments and major international organizations that defend religious freedom and civil liberties, so that Muslim countries accept a modern vision of the state, where there is equality for all, freedom of expression, thought, religion and conversion. In short, so that there is a distinction between radical Islam and politics. This is what the young people of Tahrir Square are asking for.